During their second home game of the season, the Rye Girls’ Lacrosse team fought through freezing winds and a bitter rivalry with Harrison to pull off a 17-7 victory against the Huskies. After a disappointing loss against Staples High School on Saturday, the Garnets dominated from the first play of the game on Monday to clutch an easy win. Within the first five minutes of the first half, Rye was up 4-0, thanks to two goals each from Leah Kenny and Catherine Egan. It would take three more goals, two more from Egan and Kenny and another from Ava Mullooly, until Harrison put one in the back of the net after a penalty. Rye then came back and scored two more, one from Casey Lehmann and another from freshman Ellie Hedges. At the end of the first half, Kenny scored two more goals, one being her 100th career goal as a Garnet. Rye ended the half with a comfortable 11-3 lead. 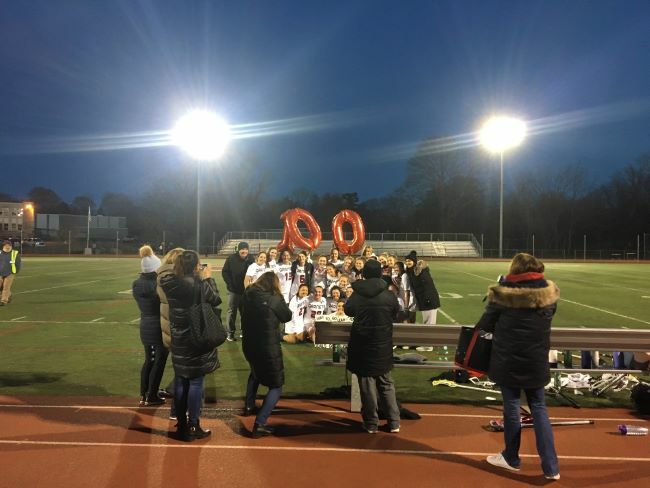 In the second half, Rye lost some of their initial stamina, but still managed to score six goals, which were scored by Jordan Basso, Hedges, Paige Drago, Caroline Stevens, Egan, and Molly Broderick. Harrison scored four more goals in the game. At one point, Harrison was losing by seven goals, the closest deficit of the second half. However, the Huskies were never able to close the gap any further, thanks to Rye’s consistent scoring and solid defense.